This part of the Node.js Bookshelf tutorial shows how the sample app stores its persistent data in Google Cloud SQL. This page is part of a multi-page tutorial. To start from the beginning and see instructions for setting up, go to Node.js Bookshelf App. Download and install the Cloud SQL Proxy. The Cloud SQL Proxy is used to connect to your Cloud SQL instance when running locally. Create a Cloud SQL for MySQL Second Generation instance. Name the instance library or similar. It can take a few minutes for the instance to be ready. After the instance is ready, it should be visible in the instances list. Be sure to create a Second Generation instance. Now use the Cloud SDK from command line to run the following command. Copy the value shown for connectionName for the next step. The connectionName value is in the format [PROJECT_NAME]:[REGION_NAME]:[INSTANCE_NAME]. Start the Cloud SQL Proxy using the connectionName from the previous step. Replace [YOUR_INSTANCE_CONNECTION_NAME] with the value of connectionName that you recorded in the previous step. This step establishes a connection from your local computer to your Cloud SQL instance for local testing purposes. Keep the Cloud SQL Proxy running the entire time you test your application locally. Next you create a new Cloud SQL user and database. Create a new database using the GCP Console for your Cloud SQL instance library. For example, you can use the name bookshelf. Create a new user using the GCP Console for your Cloud SQL instance library. In a separate command-line tab, use the MySQL client or similar program to connect to your instance. When prompted, use the root password you configured. Create the required databases, users, and access permissions in your Cloud SQL database using the commands below. Replace [MYSQL_USER] and [MYSQL_PASSWORD] with your desired username and password. Replace [YOUR_PROJECT_ID] with your project ID. Replace [YOUR_MYSQL_USERNAME] and [YOUR_MYSQL_PASSWORD] with the Cloud SQL username and password that you created previously. Replace [YOUR_INSTANCE_CONNECTION_NAME] with the Instance Connection Name of your Cloud SQL instance. Then, add the following content to the end of app.yaml. Be sure to replace [YOUR_INSTANCE_CONNECTION_NAME] with the Instance Connection Name of your Cloud SQL instance. Note: The Bookshelf sample supports three ways to set configuration values: command-line arguments, environment variables, and JSON configuration files. This tutorial uses JSON configuration files. See the config.js files in the sample code for more information. Upon completion, the script displays a message saying that you successfully created the schema. Note: During deployment npm install is used to install dependencies. If you update your app, you can deploy the updated version by entering the same command you used to deploy the app the first time. The new deployment creates a new version of your app and promotes it to the default version. The older versions of your app remain. By default the App Engine standard environment scales to 0 instances when there is no incoming traffic to a version, thus unused versions should not cost anything. However, all of these app versions are still billable resources. See the Cleaning up section in the final step of this tutorial for more information on cleaning up billable resources, including non-default app versions. The following diagram shows the application's components and how they fit together. 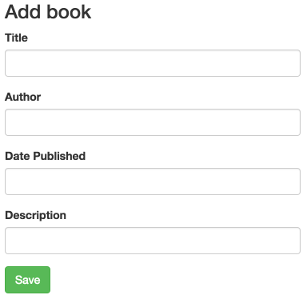 The add/edit form allows users to add and edit book submissions within the app. When a user clicks Add Book, the following code in books/crud.js sends the user to the app's /add page, which displays the add/edit form. When a user fills in the Add book form and then clicks Save, the following code handles the form's HTTP POST action and starts the process of sending the submitted data to the Cloud SQL database by passing it to the model.create function. // Save the data to the database. The books/model-cloudsql.js file contains the code that performs CRUD functions for data stored in the Cloud SQL database. For example the model.create statement above calls the create function within model-cloudsql.js, which performs a SQL INSERT operation to insert the user's submitted data into the database as a new book submission. When a user edits a book's information after it has been submitted, the update function within model-cloudsql.js is called, which performs a SQL UPDATE operation to update the book's information in the database. After users have added books, clicking the Books link navigates to the /books page, which lists all the books currently stored in Cloud SQL Database. The list function does the work of listing all the books by using data retrieved from the Cloud SQL Database. The SQL SELECT statement in the list function includes a LIMIT clause that specifies the number of records to return from the database. The SQL SELECT statement also uses the OFFSET keyword, which specifies the starting point for handling pagination and allows additional pages to be requested based on the value of token.